Sam Carchidi: Source saying that there has been no progress made between the Philadelphia Flyers and pending free agent Wayne Simmonds. Pierre LeBrun of The Athletic: Even though the Philadelphia Flyers are in the playoff race, it’s more than likely they will trade pending UFA Wayne Simmonds. Sources are saying that the Boston Bruins, Tampa Bay Lightning, Nashville Predators and Winnipeg Jets have shown interest. Simmonds has a 12-team no-trade list. Steve Simmonds: Both the Toronto Maple Leafs and Tampa Bay Lightning have shown ‘big’ interest in Simmonds. 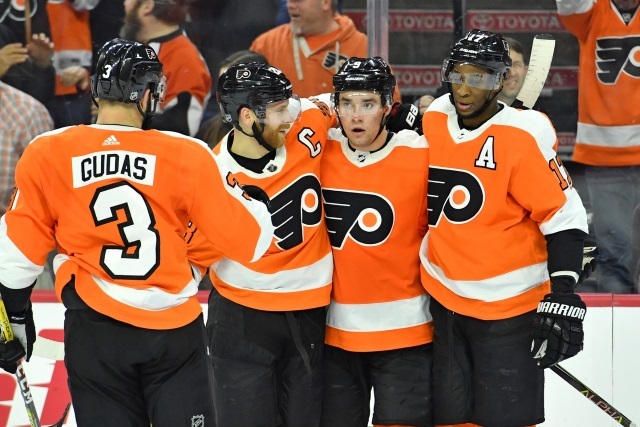 It wouldn’t be easy for the Flyers to move Simmonds with the run they are having but GM Chuck Fletcher would like to sell off some of their assets. Chris Nichols of Nichols on Hockey: Bob McKenzie on his Bobcast was talking about Philadelphia Flyers defenseman Ivan Provorov. Provorov is a pending RFA who was poised to cash in this offseason, but he’s really struggled for most the season. He’s apparently played much better of late, but what does that mean for his next contract? “Now, as for impacting the contract? Absolutely it impacts the contract. If he was an absolute stud in his platform year and matched or exceeded the totals that he put up in his second season in the National Hockey League, then I could see the Philadelphia Flyers signing him to the long-term 5, 6, 7, 8-year deal at big, big, big money for defensemen in the National Hockey League. He would be that good.